Every single story about Dominican hospitality I had heard leading up to coming here is 110% true. My madre is always checking up on me, asking “quieres algo mi amor?” (do you want anything, my love?) every 10 minutes and my padre always gives me the biggest smile when he passes. My house is always full of people coming and going, drinking some coffee and spending time together. Even though they’ve had a number of volunteers in the past, the “Americana” is still the center of most conversations, which I can’t understand very well, but the looks, pinches, and hugs validate that I’m getting the gist of it. Even though it seemed daunting to go spend 2 whole days with my host family without any Spanish classes under my belt, the weekend was full of so many new and exciting activities! I rode in carros publicos to get around closeby with some fellow trainees (these are cars that have fixed routes that you can hop on and off whenever you want….they typically have a driver, seat 2 in the front, and 4 in the back), walked around my barrio (complete with plenty of cat calls), played “volleyball” and “Frisbee” with some kids in the neighborhood, and spent lots of time sitting around, drinking coffee, and attempting to hold conversations with my madre and her friends. Just walking around my barrio you can immediately notice the different in pace of life here from the states, and I LOVE it. On every corner there are people hanging out, kids running around, and adults playing dominoes. If you imagine a 4th of July block party, that’s what it looks like. Only it’s their average weekend day! There’s so much time to read, or study, or just sit outside with friends and chat which has been really nice while I’ve been adjusting to this new lifestyle. The event of the weekend definitely was Saturday night when I agreed to go to church with my padre and another volunteer around 7:30. My padre is a man of few words but the one thing he talks about is his religion and I had noticed him going to church every night so I could tell he was excited for us to go with him. The church was similar to the one I went to in Kenya—lots of women up at the front singing into microphones at full volume, pastors yelling, people falling down, dancing, more yelling, more dancing, lots more singing, a couple of re-baptisms—I think you get the picture. It was definitely an experience (a FOUR HOUR one)! I’m sure it would have been helpful to be able to understand more of what the pastors were saying and am definitely curious to go back when my Spanish is more advanced. It’s amazing that even with the slow pace of life and how much time I spend sitting around that so much has happened. I honestly feel like I’ve been here for weeks and it’s been a rollercoaster so far but I’m basking in how different it all is and can’t wait for the 25 hours of Spanish classes we have during training this week!! 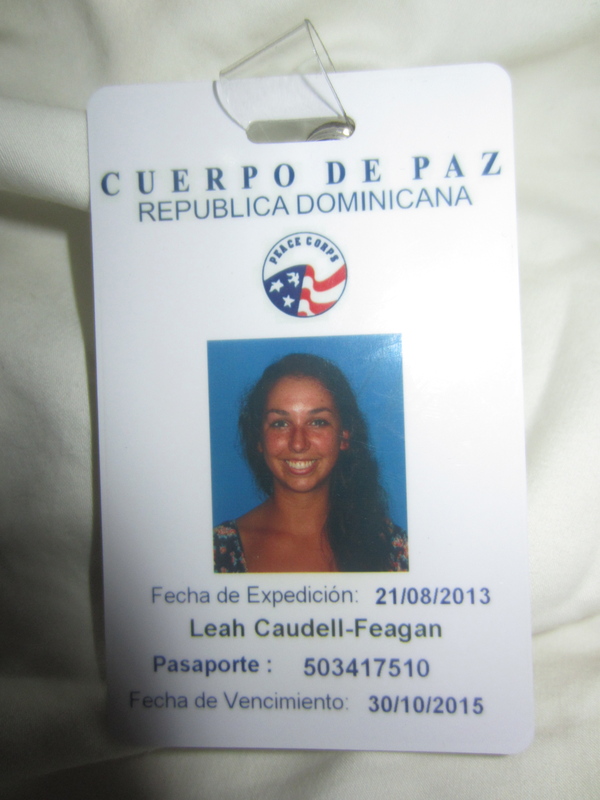 Follow the adventures of Leah as she begins 2 years serving in the Peace Corps in the Dominican Republic. I have known Leah since she was a small child and have watched her build an impressive list of accomplishments. I suspect he blog from the DR will be a great story as it unfolds! Best of luck Leah, we’ll be following along at home! This entry sure makes your Mama happy! I love you and am SO proud of you, Baby Girl!!! !